The district of Xuhui (a prime area) is the retail centre of Shanghai, well known for large shopping centres, a lavish home furnishing district, and mega electronic stores. Xuhui also has a great mix of residential areas. Tianping and Hunan Road are well-preserved areas lined with lane homes and garden villas, while the new suburb of Xujiahui offers tall apartment complexes and wide streets. It's a favourite for professionals who commute to Pudong, because Xuhui is a major transportation hub. Historically, Xuhui district, along with neighbouring Luwan, was the Catholic core of Shanghai. French influence can still be seen in the architecture of buildings such as St. Ignatius Cathedral, and the remaining boulevards. Xuhui was once a luxury residential area. After the revolution, Shanghai's municipal government developed what had previously been an area of factories, into a commercial zone. Xuhui district became a prime retail area in the early 1990s. While a large portion of Xuhui caters to shoppers, portions of this area have now been redeveloped as residential spaces. 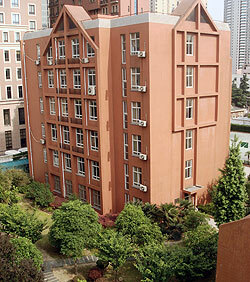 The educational tradition begun by Jesuits in the Xujiahui neighbourhood continues in Shanghai Jiao Tong University, a premier university in southern China. Beyond the hustle and bustle of the shopping areas, are several popular residential areas. Xujiahui is a new community with numerous apartment compounds. Many of Shanghai's young and working professionals have made this area their home, as it is near the larger malls, as well as the metro station, and is modern and convenient. Those who want quieter, more upscale living may prefer the communities along Tianping and Hunan Roads. Popular with both locals and expats, this tree-lined area straddles both the Xujiahui Park and the French Concession, and is picturesque, up-market, and elegant.